Elizabeth delayed the opening of this Parliament that had originally been summoned in the autumn of 1588 in response to the defeat of the Spanish Armada for as long as she could afford to, knowing that the Commons would be eager to broach two topics, religious debates and foreign policy, that she usually reserved to her prerogative. 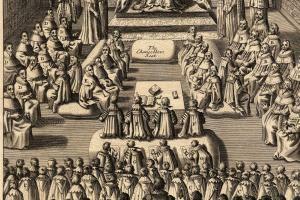 By this time radical Puritan sectaries were perceived to be as great a threat to the Church of England as Roman Catholic seminary priests and the Jesuit mission. The Lord Chancellor Sir Christopher Hatton speaking on Elizabeth’s behalf at the opening on 4 Feb. commanded the assembled Lords and Commons not to ‘so much as once meddle with anie such matters or causes of religion, excepte it be to bridle all those, whether papists or puritanes, which are therewithall discontented’.1 This was followed on 9 Feb. by Richard Bancroft’s widely reported and influential sermon at St. Paul’s Cross, undoubtedly attended by many MPs, in which he attacked Puritanism in the wake of the ‘Martin Marprelate’ tracts against the Church of England and its episcopacy. Religion was in fact not the only ‘stumbling blocke’ in this Parliament; Elizabeth intervened against bills concerning purveyance and Exchequer abuses, and there was also some opposition to the unprecedented request for a double subsidy. A senior lawyer, Serjeant Thomas Snagge, was appointed Speaker. The only surviving private diary of this Parliament covers just the first fortnight, 7-19 Feb., and has been attributed to Henry Jackman, a London cloth merchant representing Calne in Wiltshire. Humphrey Davenport’s motion on 25 Feb. for consideration of ‘some particularities’ in ecclesiastical causes elicited an immediate attempt to suppress religious debates by the queen’s secretary John Wolley, one of eight privy councillors sitting in the Commons. A long document detailing proposals for a conference on religion survives among the papers of John Thynne, MP for Wiltshire, together with Archbishop Whitgift’s refutations of each petition. Undeterred two days later Henry Apsley, representing Steyning, introduced a bill against pluralities, one of the abuses highlighted by Puritan critics of the Anglican church. This passed the Commons but progressed no further than its first reading in the Lords on 13 March.4 Although no bills of a religious nature were enacted in this Parliament, two further documents attest to a strong undercurrent of pressure for ongoing reformation. The first, an anonymous petition ‘for suspension of the penal laws’ may have been drafted in committee but was never presented to Elizabeth. The other is a supplication by John Stubbe, MP for Great Yarmouth, who had lost his right hand ten years earlier on a charge of sedition for daring to counsel Elizabeth in print on marriage and the royal succession.5 Both complain in particular of the persecution of nonconformist ministers under the ex officio oath, whilst protesting their absolute loyalty and obedience to the crown. The subsidy bill received its third reading in the Commons on 10 March. A speech attributed to Henry Jackman drew attention to the heavy burden of taxation already laid upon the country and warned against setting a precedent ‘dangeros both to our selves and our posteritie’ by voting double subsidies once the immediate threat of invasion had already been averted.6 Two subsidies with four fifteenths and tenths were nevertheless granted, and at the close of the session both Houses jointly petitioned Elizabeth to make a formal declaration of war upon Spain, pledging further support as necessary toward this end.7 There is no record of any speech that she may have made in response. At the dissolution on 29 Mar., Easter Saturday, a total of sixteen public and eight private measures were enacted. See also the Appendix to the 1558-1603 Introductory Survey. 1. 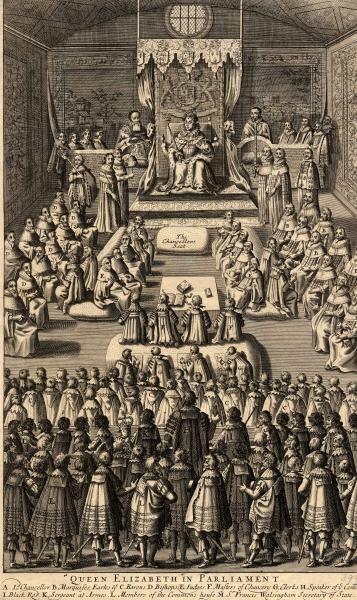 Proceedings in the Parliaments of Elizabeth I, ed. T.E. Hartley, ii. 419-20. 3. D’Ewes, 428-41; Procs. ii. 470-3. 4. Procs. ii. 429-32, 439-69. 7. Procs. ii. 433, 493.